Other than good old Apple Pie, this applesauce cake has to be one of my favorite things to bake in the Autumn. My grandmother used to buy a bag of Macintosh apples, make some fresh cinnamon applesauce and then bake up a few of these cakes. But to be honest, we make this recipe all year round. If I don’t have time to make applesauce, I just cheat and use those plain applesauce snack cups that you get in the grocery store. I just add a bit of extra cinnamon to the applesauce and mix it in….and the whole cake comes out tasting just as nice. We just made this cake today and I’m literally devouring one of the butterflies that you see in the picture above as I type (I have zero willpower). 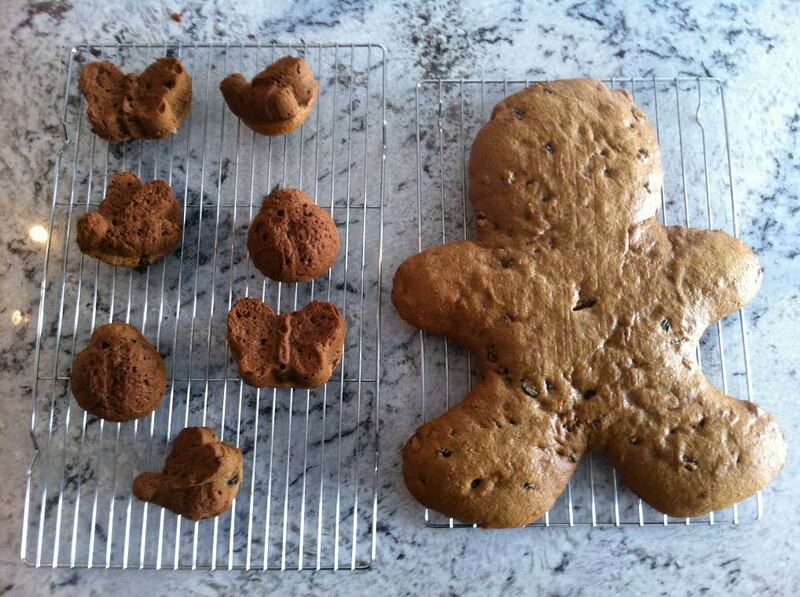 This batter is quite versatile…my boys love making it in a gingerbread man baking pan like you see above and then they devour him limb by limb (they think it’s hilarious when they chomp down on his head….sounds twisted, I know). We also use it to make muffins (either standard or mini size, or specially shaped muffins like the insect ones in the picture). Grease cake or muffin pan, or insert muffin liners if desired. Blend together flour, sugar, salt, cinnamon, baking soda and nutmeg in a large bowl. Melt butter and then stir into flour mixture. Add in egg and applesauce and mix well. Stir in desired amount of raisins (I use quite a lot). Bake in preheated oven until cake is golden brown and knife inserted in the center comes out clean. Cake should also spring back when you press on it.